I find it hilariously odd that women are quick to enforce the “wives submit to your husbands” bible verse without preaching the other half that says “Husbands love your wives as Christ loved the church and gave himself for it.” The debate of who should do what first is really just another issue of what came first- the chicken or the egg? But that’s not what I want to focus on. Husbands need to love their wives; wives need to submit to their husbands. The sad reality is many ‘virtuous’ Christian women are submitting to men who do not love them; hence they end up battered, used, abused and emotionally abandoned. Many Christian women are submitting to men who do not understand God’s design for marriage! Many Christian women have lost their identity in Christ because they have replaced Christ with a man- a man they cannot approach, a man they cannot challenge when he wrongs them, a man they cannot be themselves around, a man who uses them for brief moments of pleasure and drains them of whatever it is they have in them. Yes, this is the reality many Christian women would not share with you, and even if they did, they’ll explain the devil is at work in their marriage and they are putting him to shame by losing bits and pieces of themselves everyday. Hilariously odd and excruciating indeed! To be a virtuous woman does not mean you should accept mistreatment and abuse in any form! 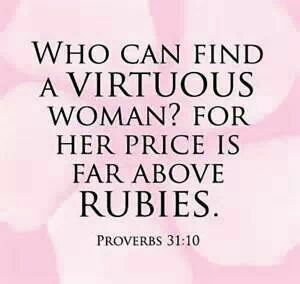 As a matter of fact, a virtuous woman knows her worth, and she appreciates herself, just as much as she appreciates her family. She speaks up when she has something to say, and she is heard by her husband. In fact, if you read Proverbs 31 properly, you’ll see that the woman you aspire to is not her husband’s wet dog! She makes investments and goes to work! She’s up early to make sure everyone is catered for, then she goes out to earn a living! She makes decisions, and prepares ahead! Her husband is respected, not because of who he is, but because of WHO SHE IS! He praises her awesome strength and beauty, and encourages her with kind words! So where did the virtuous women of today get their ideas of subservience in the face of mistreatment from? We easily blame men for the mistreatment of women, but the truth is women volunteer themselves to be maltreated. Women, in a bid to fulfill scriptures they haven’t studied with wisdom, make themselves easy prey, and lose their worth with time. I can really imagine how God weeps when he sees his daughters subduing their purpose to walk in the shadow of the man he designed to give them guidance and encouragement. The woman from Shunem made an executive decision that saved her son’s life. She exercised her authority when she needed to! Ruth was working! A modern day Ruth is that single lady who has a car, but is scorned by the ‘virtuous wives’ because they believe she will never get a good husband, due to the lack of submission a car depicts (how they arrive at these things is still a mystery to me). Ruth was busy making something of her life, and she married a man who saw her hardwork, appreciated her for it, and elevated her! Not one who saw her hardwork and told her “You know you might soon be earning as much as me, and that makes me feel less of a man”. Nope! He put her in a position of authority, and Ruth became one of the women in the bloodline of Jesus (Matt 1: 5). Esther approached the king with the most sensitive situation of all; afterall he was her husband who fell in love with her! She knew if not for anything, that love could help her win his favor!